The Prince Henry Cliff Walk is an adventurous 7km walking trail between Scenic World in Katoomba and Gordon Falls Lookout in Leura. It follows the cliff edge overlooking Jamison Valley with lots of beautiful lookout points along the way to enjoy some of the best views in the Blue Mountains. 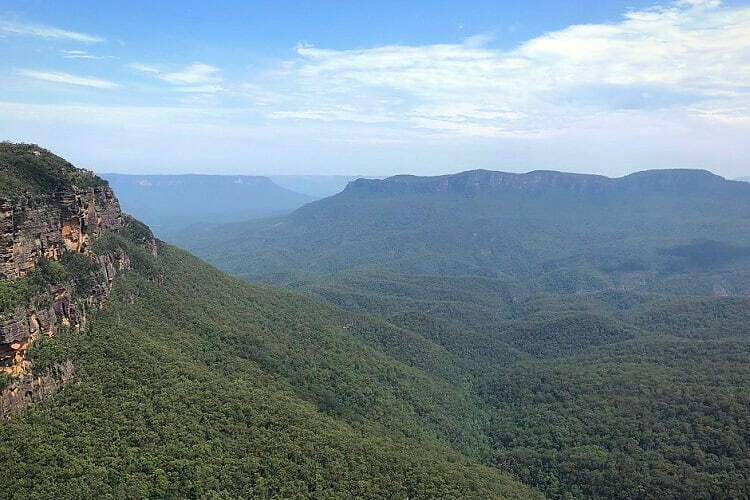 The Prince Henry Cliff walk can be commenced from either Scenic World in Katoomba or Gordon Falls lookout in Leura. Both locations have ample, free car parking available. To start at Scenic World, head into Katoomba Street from the Great Western Highway, then follow Cliff Drive to the car park at Scenic World. To start the walk at the Gordon Falls lookout and picnic area, turn into Leura Mall from the Great Western Highway and follow Olympian Parade to the parking area. Alternatively, you can also use public transport and catch a bus – Blue Mountains Explorer Bus or local bus – from Katoomba train station to Scenic World. Named in honour of the third son of King George V and Queen Mary, the Prince Henry Cliff Walk was completed in 1936 after several years of construction. The track was established to help boost local tourism and to serve a public need after years of economic depression in the early 1930’s. Overall the signposting for this track is good with several signs for Prince Henry Cliff Walk along the way to keep you on the right track. However, there are lots of intersections with other walking tracks in the area so it’s advised to always pay attention to avoid taking a wrong turn. At Scenic World, look out for the green signpost which marks the starting point of the Prince Henry Cliff Walk. This is also the starting point of the Katoomba Falls round walk which descends into the valley with great views of the waterfall. At the first major intersection, turn left to stay on the Prince Henry walking track. However, if you have time and energy and you’re keen to see the waterfall from close by, continue straight to do the round walk. What’s great is that the Katoomba Falls round walk reconnects with the Prince Henry Cliff Walk when it comes out of the valley a few hundred metres further away, so you won’t actually miss anything. The first highlight of the Prince Henry Cliff Walk is the popular Katoomba Cascades, a series of small waterfalls on the Kedumba River. The cascades is where the river turns into Katoomba Falls, a segmented waterfall that drops 150m into Jamison Valley. From there, the track continues along the cliff edge towards Echo Point, with several lookout points offering panoramic views of Jamison Valley, Katoomba Falls, Narrow Neck and Mount Solitary. The most popular lookout in the Blue Mountains region is undoubtedly Echo Point. Visited by millions of tourists each year, the Echo Point lookout offers the best views of the Three Sisters. From Echo Point, follow the Three Sisters walking track to continue the Prince Henry Cliff Walk. It’s worth doing a small detour down and up the famous Giant Stairway to see the Three Sisters from close by, before continuing the main path. The track then continues along the cliff edge where it connects with the Leura Cascades walking track further north. Similar to the Katoomba Cascades, the Leura Cascades are a set of small waterfalls on Leura Falls Creek, leading up to a beautiful lookout point with amazing view of Jamison Valley. The Prince Henry Cliff Walk connects with the Leura Cascades walking track and continues on to Bridal Veil View and the Tarpeian Lookout point. Both these lookouts provide views of the waterfall where Leura Falls Creek drops into the valley. A short detour will get you to these two lookout points which are clearly signposted. The last section of the Prince Henry Cliff Walk is home to a few more lookout points that never get very crowded, yet offer some of the best views in the Blue Mountains. Leura’s best kept secret is the Olympian Rock Lookout. While most tourists visit Echo Point to see the Three Sisters, the Olympian Rock lookout point offers views of the Three Sisters from the other side. If you look closely, you can even see glimpses of the Ruined Castle, situated between Mount Solitary and Castle Head. An interesting highlight in this final section of the Prince Henry Cliff Walk is the historic Buttenshaw Bridge between Olympian Rock and Elysian Rock lookouts. The original bridge was built in 1936 and was replaced with a modern 14m long steel bridge in 2015 by the Blue Mountains City Council. The Gordon Falls lookout and picnic area marks the end of the Prince Henry Cliff Walk. The views from the lookout to Mt Solitary, Kings Tableland and the waterfall are mesmerising, although the waterfall is hardly noticeable during periods of dry weather. With a large parking area, tables and toilet facilities, the picnic area at Gordon Falls is a great spot to have a rest and recharge after an adventurous half-day of hiking. Park your car either at Scenic World or at the Gordon Falls lookout and picnic area, depending on where you want to start the Prince Henry Cliff Walk. Otherwise you can also catch a bus from Katoomba train station to Scenic World. Click here to see a larger version of the map below.